This story is dedicated to Mary Janet McConnell Smith, a descendant of Isabella WATSON and her husband John McCONNELL. Mary was born in Seattle, lived in Montana and now lives in Tennessee, USA. Mary has been, and continues to be, central to the research and interest in the story of Isabella and John McConnell and their descendants. Isabella WATSON was born on 18 March 1858 at Mosshill Farm, Dallmellington Road, Alloway, outside Ayr, Scotland to Thomas WATSON and his wife Mary HUNTER. Thomas and Mary were tenant farmers at Mosshill Farm. Photo left: Isabella, in a photo taken by the photographer Kyles, in Ayr, Ayrshire, Scotland. Photo from Mary’s collection. Date uncertain; was this photo taken about the time of Isabella’s 1882 marriage? Isabella was the last born to the Watson family of four; she had a half-brother William [William WATSON] born in 1847, a brother Thomas [Thomas WATSON] born in 1854 and an older sister Janet [Janet WATSON] born in 1856. In the 1861 census Mosshill Farm had ’60 acres’, Isabella was 3 years old. Before the 1871 census was conducted the Watson family moved to Mount Oliphant Farm just outside Ayr. 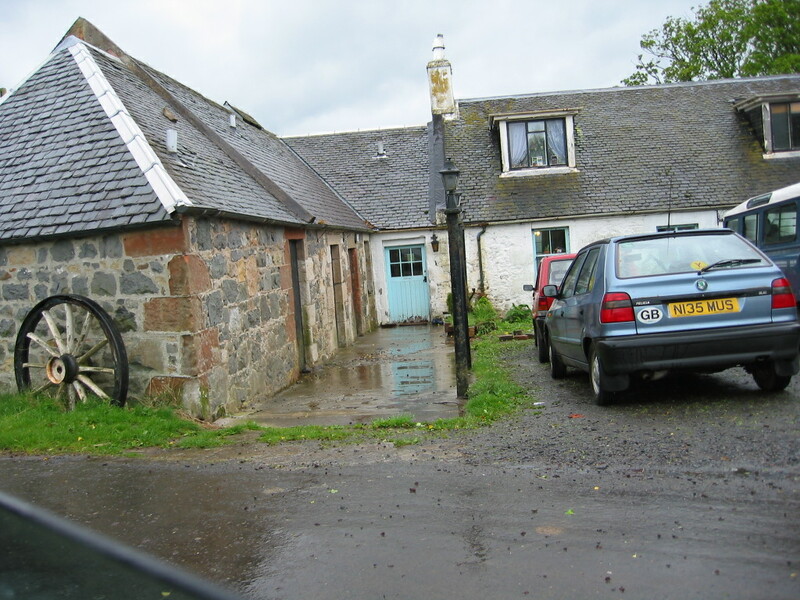 The farm had some renown as the previous home of Robbie Burns during the poet’s childhood. Mount Oliphant was a larger farm, here Thomas was able to rent 71 acres. The 1871 census showed the Watsons as a farming family; as well as her farmer father Thomas, Isabella’s mother Mary also listed her occupation as ‘farmer’, and Isabella’s 16 year old brother Thomas is listed as ‘farmer’s son’. Her half brother, William, was away from home. Isabella was still at school; her older sister Janet, 15 years old, worked as a domestic servant. On 2 Mar. 1878, Isabella’s father Thomas, only 50, died of ‘paralysis of the brain’ at Mount Oliphant Farm. On 22 November 1880 at Mount Oliphant Farm, Isabella’s older sister Janet, a 24 year old dairymaid, married Gilbert SPEIRS, aged 22. After their marriage Janet and Gilbert moved to Rankinson Farm, not far – within walking distance – from Mount Oliphant. It seems likely that Isabella, Janet, Thomas and their mother Mary visited back and forth as frequently as possible; the extended Watson family stayed in close touch all their lives, even when separated by the eventual move to Saskatchewan, Canada by parts of the family. The 1881 census showed Isabella’s brother Thomas (26) had taken over responsibility for renting Mount Oliphant Farm. Isabella (23) and her mother Mary (53), also lived there, worked on the farm and no doubt sold eggs and extra produce in the Ayr markets to supplement the family income. About this time John McCONNELL, a 26 year old gamekeeper entered Isabella’s life. He lived and worked at Old Knockjarder, Dalrymple. On the 5th of October 1882, 24 year old Isabella, a ‘farmer’s daughter’ married John, 27. The marriage took place at the bride’s home, Mount Oliphant, as was the custom. John’s parents were John McCONNELL, a quarrymaster, and his wife Mary MORTON. Isabella moved to Old Knockjarder with John and they continued to live there for some time. Their first child, a daughter Mary Hunter Morton McCONNELL, was born there on 23 March 1883. 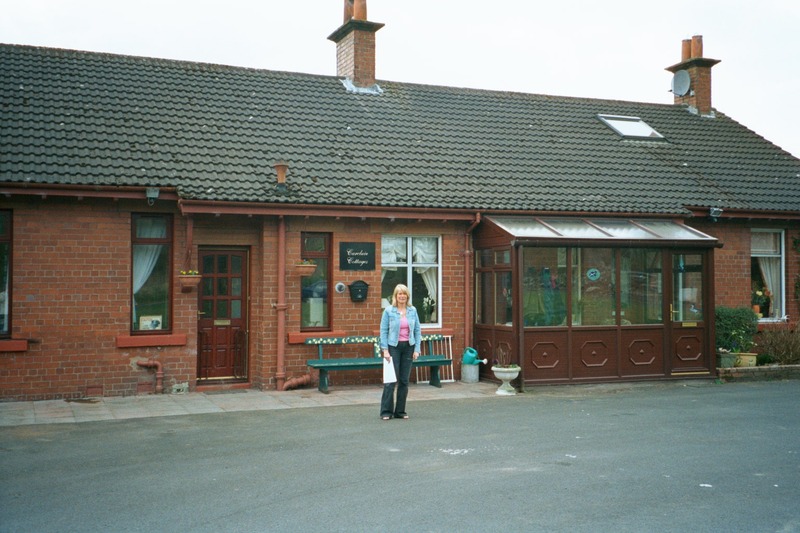 By the beginning of 1885 Isabella, John and Isabella had moved to Carcluie Cottage, near Ayr in Ayrshire; on 17 January 1885 a son, John McCONNELL, was born there. Carcluie Cottage was to be their home for the next nineteen years. It was at Carcluie Cottage that the remainder of Isabella’s and John’s children were born. Photo above and below of Carcluie Cottage: from the collection of L.A., a Watson descendant who still lives in Scotland. A second son, Thomas Watson McCONNELL was born at Carcluie on 08 October 1886. 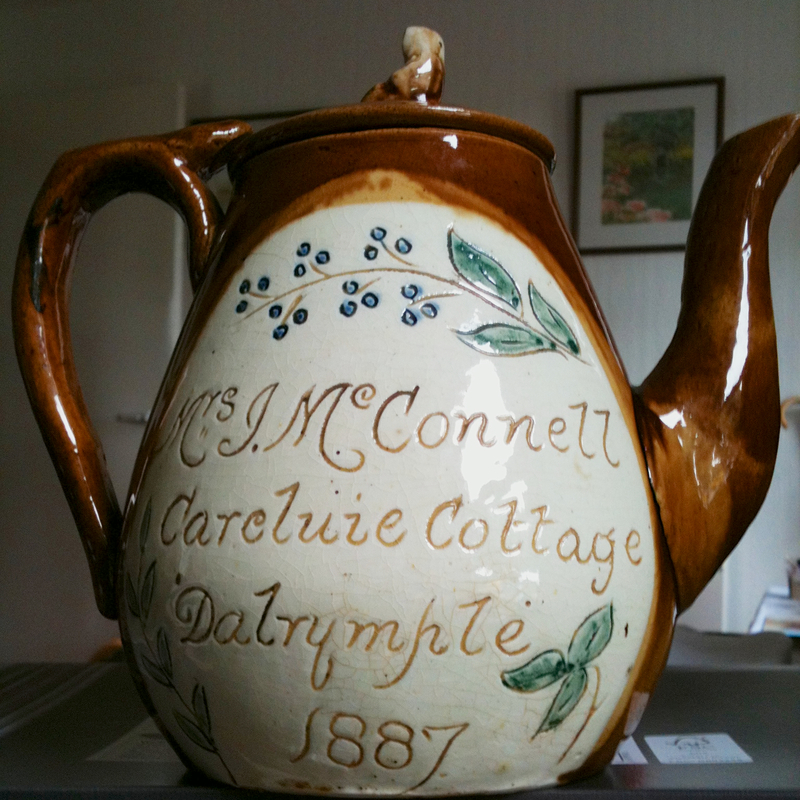 In 1887 Isabella received a gift of a teapot; this teapot now is owned by Isabella’s great granddaughter May Wood in Ayrshire. In 1887 Isabella was 29 years old; she and John had been married for five years. Would either of these events have prompted the purchase of a gift to mark a special occasion? Between 1888 and 1895 three additional children were born at Carcluie: Janet Watson McCONNELL (b. 04 October 1888); Isabella (Isa) Watson McCONNELL (b. 05 April 1891); and Elizabeth (Bessie, Betty) Wyllie McCONNELL (b. 10 May 1895). Photo left: Isabella, John and their family. Photo is from the collection of Mary Smith (in Tennessee). May Wood in Ayrshire, Scotland also has a copy of this photograph. The photograph was taken in the summer (leaves on background tree) 1895 as the baby on Isabella’s lap is Elizabeth born in May 1895. 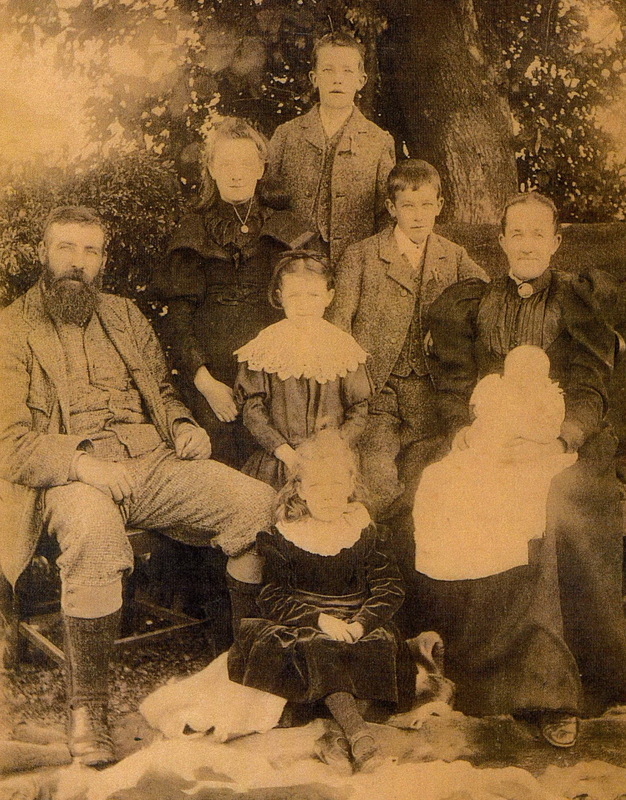 Others in the photo, left to right: John (father), backrow – Mary, John (standing on a stool? ), Thomas. Girl in front with large lace collar is Janet, girl sitting on ground is Isabella. After 1895 two more children were born at Carcluie to Isabella and John. Margaret McCONNELL was born 10 January 1900. Sadly, Margaret did not reach her first birthday; she died on the 16 December 1900. William Watson McCONNELL, born 16 February 1902, was the youngest of Isabella and John’s children. Perhaps it was from about this time that Isabella became ill; we will likely never know. If so, the last year’s of her life were difficult, with a large family of eight children, the youngest still barely a toddler. What is known that she died on 11 June 1904 in the Western Infirmary Glasgow Residence. Cause of death was given as “excision of breast”; more specific information about the reason for the breast operation was not given. Perhaps this was an operation that had disastrous results? Clearly the medical techniques of the time (1904) bore little resemblance to the medical possibilities of today 109 years later. Isabella’s husband John was with her and signed the death registration. Several things about Isabella’s and John’s lives at the time of her death are unclear. While Isabella and John had lived at Carcluie Cottage since at least January 1885 – and their son William was born there in 1902 – Isabella’s ‘usual residence’ in 1904 was given as “3 John Street, Ayr” on her death registration. Also, John’s occupation, which had been as a gamekeeper for many years, was given as “auctioneers storeman”. Had Isabella and John left Carcluie Cottage and moved to Ayr? Did John, 49 years old in 1904, find the work as a gamekeeper too strenuous? Or had they moved to Ayr to be closer to amenities such as doctors, shops, etc.? Whatever the reasons for the move and Isabella’s unexpected and untimely death, the McConnell family’s future was drastically and permanently changed.